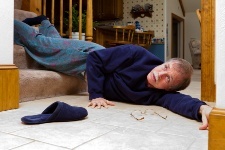 Everyday Falls Can Cause Significant Injuries for Seniors. It seems crazy, but your health is at risk with every step you take. Every year, one in three adults, aged 65 and up, fall down, resulting in more than two million trips to the emergency room. Falls are actually the leading cause of injury death among seniors (aged 65 and up), but really, anyone can be a victim. Now don’t let this news scare you into sitting on the couch all day. After all, summer is right around the corner and I’m sure you’re excited about getting out there and enjoying the fresh air. Exercise is also a great way to prevent falling because it keeps your bones and muscles strong. Over the winter your home may have become damaged. The evidence may have been covered by snow, and, quite frankly, the weather hasn’t exactly been inviting you out for a look. Check your wooden steps for stability and check if there are any cracks in your concrete—this is essential because load-bearing damage from snow and spring thaw may have caused some dangerous damage and can help prevent falling. Also, prevent injuries by making sure that your walkways are cleared from overgrowth and stray branches. And remember, don’t just notice the problems, fix them. You may not want to go out and spend $50 or $60 on walking shoes, but look at it this way: it’s a lot cheaper than a trip to the hospital…or worse. Walking shoes protect your joints and muscles by relieving pressure and emphasizing form. Sandals are okay for little jaunts out to dinner, but for anything longer than 10 minutes, you want to be equipped with proper walking shoes. If you’re on any prescription drugs, you want to be aware if there are side effects causing dizziness or fatigue. These side effects can increase the chance of a fall while walking, so you need to know before it’s too late. To prevent injuries, you want to be aware of all the side effects of your prescription drugs. If the side effects start to interfere with your life, then ask your doctor to see if you can switch your prescription. It’s also important to stay hydrated when you’re walking, regardless of temperature. Drinking water before and during a walk can reduce swelling in your feet and prevent cramping. Scheduling a trip to the eye doctor is a good idea this time of year. You want your eyes functioning at a level that won’t prohibit you from seeing any potential hazards—this is vital to prevent injuries. Cracks in the sidewalk, uneven surfaces, and debris can all result in injury. You also want to be aware of the countless other people out there. Joggers, cyclists, dog-walkers and children will all be sharing the pathways with you, so being alert can help you avoid a collision. If you’re out for a walk and find yourself getting a little tired or sore, sit down and take a rest. Remember, it’s been a long winter and your body may not have adjusted to exercise. This transition takes time, so listen to your body and give it some rest when needed. Simply take a seat and observe the environment around you! Don’t be another hospital statistic this year. Be safe, exercise, and have fun—but prevent injuries while you’re at it! Hausdorff, J.M., et al., “Gait variability and fall risk in community–living older adults: a 1–year prospective study,” Archives of Physical Medicine and Rehabilitation 2001; 82(8): 1050–6. Hornbrook, M.C., et al., “Preventing falls among community–dwelling older persons: results from a randomized trial,” The Gerontologist 1994: 34(1): 16–23.